Arnold Schwarzenegger (who shall henceforth be referred to as Arnie), utterer of “I’ll be back”, was born in Thal, Austria, sixty-eight years ago today. Arnie began weight training when he was fifteen years old, won the Mr. Universe title aged twenty and the Mr. Olympia title aged twenty-three. Arnie broke into acting with the 1982 movie, Conan the Barbarian. He has since appeared in many Hollywood action blockbusters including The Terminator, Commando, Predator, and Total Recall. In 2003 Arnie became the 38th Governor of California, a position he held for two terms. In 1977 Arnie admitted to using performance-enhancing anabolic steroids for muscle maintenance when ‘cutting-up’ for competition. Photo Credit: Michael Coghlan via CC. Judging this week’s contest is KM Zafari, winner of MB1.04, MB1.06 and MB1.40. Read her winning stories and what she has to say about flash fiction here. A story of between 90 and 110 words starting with CATCH and ending with PHRASE and incorporating the photo prompt. 1. The Terminator; 2. Gone With the Wind; 3. James Bond; 4. Forrest Gump; 5. Apollo 13; 6. Casablanca; 7. Star Wars; 8. Jerry Maguire; 9. Field of Dreams; 10. The Godfather. “Catch a cold out here,” He said. She nodded and attempted to conceal the needle in the crevice between her forearm and thigh. He sat down. She cursed under her breath. The leaves blanketed the ground and displayed all her favorite earthly tones. She would lose hours every day staring at each one of them, glassy-eyed and high. “You don’t have to worry about me. I’m fine,” she said. After that, they sat in silence. She watched the wind twirl and tumble the leaves as she twirled and tumbled words in her mind, trying to synthesize an excuse to leave or a magic phrase. Such a sad state to be in. A beautiful setting contrasts with the ugliness of her situation. I didn’t hear her and when I turned round the object she’d tossed in my direction lay in two large chunks at my feet. Mother always had an unusual turn of phrase. An odd woman, to be sure. I want to know more about her. At least she didn’t hit him! I wonder what her phrase would’ve been for that! “Catch a glimpse of heaven!” he’d said, thrusting the syringe into my naive hands. At fifteen the sight of the needle had made me drop it. He had laughed, pushed my sleeve up and stuck it into my arm. I’d screamed then, as I scream now—for more. I scream to get that glimpse, but no amount of pricking can get me there. Just a cold, lonely road to hell, snakes forth. My tattoo covered arms camouflage my juvenile delinquencies. I stick one into the dragon’s eye, “Show me heav…” The syringe falls, with me, upon the autumn leaves, even before I can complete the phrase. Kinda scary, I got a snagged a little on “snakes forth” – but I did like the similar image of snake and dragon. Then that made me wonder if a more direct connection (snakes & serpent, maybe?) might have been a stronger connection. Thankyou for reading. Yeah I guess snake and serpent may have been a better pairing but somehow I felt that a dragon tattoo was more common. The dragon reference also reminds me of ‘chasing the dragon’ so for me the phrase does double duty. Grim picture of getting hooked so young. I really appreciate your comments. Thankyou. Catch a crook, save someone’s stuff. Catch a drug dealer, save many people’s lives. As a cop I chase the dealers. They know how to work around me. They also know how to work with me. I let the small fish work the marijuana trade. They keep the college kids stoned and even sell to a few people I know socially. But the grass slingers provide another service. They are my eyes and ears on the street. They help me keep out the hard drugs. It’s a dangerous line I walk, but I believe the end justifies the means, if I could borrow Machiavelli’s favorite phrase. Dealing with the devil here, the road to hell and all that. This is a line I would not want to walk. I know of kids in my area whose parents grow weed and sell the stuff, then they in turn get hooked and progress higher up the chain. An industry that spawns misery everywhere. “Catch me if you can!” I laughed and ran holding her doll over my head. She came after me screaming my name as I rounded the oak tree. My mother was slouched under it. She hadn’t been the same ever since Dad had been ‘put away’—her words. I stumbled over her leg as I rounded the trunk. She fell sideways and remained still. My sister squealed as she snatched her doll and dashed. I looked at my mom, her eyes were open, but she wasn’t seeing me I could tell. “Mom, what’s…” I saw the syringe half hidden under the leaves even before I finished my phrase. Definitely a week for sad stories. Yeah! I should have written something fun. Now I’m depressed. “Catch fire and burn is the only way to live,” she said, leaning back and exhaling a lungful of thick, cloying smoke. She was loose, free, fearless. A needle stuck straight in and drawing vitality from the veins of the world. Great imagery of her fearlessness and energy as ‘a needle stuck straight in and drawing vitality from the veins of the world’. The needle slid under my skin and then he dropped it into the brown leafs beneath our feet. I sighed with relief as the insulin took hold so we could continue our hike. ‘Can’t!’ A fiery stitch flared up in his side. It was never easy being the baby brother, especially Drake’s. He made sure Jimmy felt every inch he was shorter, every month he was younger than him. ‘I’m fine. You better keep going. They said you’d be ”dead meat.”’ The real concern in Jimmy’s voice- a hot needle of conscience-made Drake stop. It was never easy being the older brother, especially hopeless, useless Jimmy’s. Drake doubled back kicking up the dead leaves so they replayed their autumn descent. I continually tell my kids they love each other really when they’re bickering away; I know when the chips are down they’d be there for each other – just like your story. New kid’s eyes loosen. He comes closer. you need a syringe for Ecstasy? I let it go. His lips look like naked woolly worms. I picture my cells morphing into hairy emu’s. Ha. I like this guy. My eye roll tells New Kid it’s okay. Auto-emu disease. Love that. This prompt hits close to home, as my niece was just diagnosed with diabetes. Tough disease. Love the humor in your piece. Thank you. Diabetes is so common these days, it affects so many of us. The mothers watch their children gambol in the autumnal carpet. More leaves flying. The mothers continue to smile as their children scatter russets and golds, twirl fairytale dreams. A glint of silver winks up at one girl. “Hey, I’m Sleeping Beauty!” she squeals with fake bravado as the sharp wand pricks her finger and she sees the blood drip. And the woman screams as the spell claims her child; her heart crying words her mouth cannot phrase. A happy scene turning tragic. No fairytale ending this. Lovely use of final bookend- which I found a really tricky one. The horror of this nightmare set against fairytale stories is excellent. Thank you. I had real, real difficulty with that final bookend, not much you could do with it at all, although everyone else seems to be proving me wrong! Ooh, tragic, Steph. Great use of the bookends to tell the story in the photo. Catch the sun on your face, Johnny. Twenty minute’s worth. Twice a week. Outside inside. Six hundred steps. Clear your mind. Don’t think. Enough time to think in the cell. Too much. Solitary. Too dangerous to mix with the murderers and the rapists. No visitors. Twelve properties on the outside. Three ex-wives to enjoy them. Five fast cars. Four kids. Millions. Kilos. Grams.Thousands high. Or dead. A life in numbers. 35 years. Shake that off, Johnny. That’s for the cell. Not the sun. 35 years. Let the words blur in the heat. Let them drift. Empty them. Not a sentence just a meaningless phrase. Love the pacing to this piece, and the bookends fit perfectly. Chris ignores his friend’s grumbling. As the pair trudge through the dark woods, Chris’ torch beam catches something beneath the wet leaves littering the forest floor. He bends down to pick it up. It’s a used hypodermic needle. Before Mike can say anything, a horde of strange, winged creatures no taller than children, emerge from the darkness, to encircle them. The lead creature bows in return and signals for them to follow. “What was that?” whispers Mike. I love it’s a ‘formula’; original and fun (when so many of us have gone down a grim road). Also the bookends fit really well. Thank you, Marie. That means a lot, especially with the trouble I had using that last bookend. “Catch her!” Joey shouted, Captain of his team. Two rows of children stood opposite, colorfully lining sidewalks and the tarred street, clinging to the outdoors. Boys on one side, tall houses behind, girls on the other; a green parking garage behind with flower patches cluttered with the last of autumn’s leaves. Gutters still draining the rain into steamy storm sewers filled with used hypos and rubbish. Maria tore from the line, dodging left, right and forward trying to break through the boys. Joey caught her, kissed her! At eight years, her heart danced breathlessly, hearing his phrase. We used to play in the streets of Philadelphia every chance we got, trying to extend summer fun well into the fall. I felt such melancholy while writing it. “Catch this!” Eduardo snarled. He tore off Doctor Stevens’ protective face mask and sneezed directly into his face. Eduardo’s illness had proven that the serum was incomplete. The doctor had no idea what the flu-like symptoms would become. Doctor Stevens never finished his sentence. They symptoms manifested quickly in the doctor and before long he was reduced to a pile of hair. As a survivor, Eduardo was the one to coin that phrase. Effortless use of the bookends and another fantastical story. “Catch and release laws for leaves are too rigid.” Alma recoiled her repurposed lasso, loosening an autumnal cascade of colors. Alma latched another limb. Blanketing Myron in the fall, the descent deafened out his phrase. “Catch ʼel for it, you will,” Rodney sneered. “It was ʼer!” Rodney shouted. Oh no! I found an errant, misbehaving punctuation mark, naughtier than my quick fingers! Oh, David, our gracious host, could you please change the ? mark after “You talk funny” to a small splatter of a period, please? The orange loops through the air and hits Arnold’s knee. Arnold stares silently at the orange. Catch-me-if-you-can slithers across her smile. She Ts her arms against the sea wind. The video cuts out. You freeze the world around that T. A ghost of the goading toddler, shrieking at your lumbering dinosaur pursuit. You know what happened after the cut. They sent you to the morgue because you’re the stoic one. And you’d be able to find her in that broken thing on a stainless tray. There’s no stoicism when it’s your daughter. A hatred frays the shreds of your heart for the hand controlling the camera. Her misunderstood boyfriend. Her supplier. And the reason for mistrusting her use of that phrase. Wow, what a powerful piece, Nancy. Thank you so much, Jacki. I sat down to do something humorous for Microbookends this week. Ah, well. This is heart breaking. Great writing. Thank you, Marie. It’s such a fine line between dealing sensitively with death and getting melodramatic. The feedback means a lot to me. WOW. This hits hard. Well done. “Catch the news, dear?” Charlotte said to the paper that hid Sebastian’s face. Probably a job-related techno babble document. “Uh-huh,” he responded with his usual inattentiveness. “Drug use has been legalized, “she lied, testing his degree of disinterest in anything she said. “That’s nice, darling,” Sebastian said without looking up. It should be, “Time wounds all heels.” Plunging the syringe into Sebastian, Charlotte considered that the more appropriate phrase. She sounds as fiery and golden as autumn. I sound as rusted and dry as autumn. “So what is the difference between us?” I ask. She smiles like there’s no sign of winter. “I have hope,” she says. Her words slide, life-green, through my veins. And I begin crossing the void between us, clinging tight to each word of her phrase. Such an excellent concept–the two sides of autumn as two sides of a single struggling person. Catch in her voice: ‘Try anything’. Hope on a tightrope. A syringe expertly filled, then emptied. Moments become years; hope and despair see-saw. Eyes open, the memory snapshots joy for the future. Glib platitudes flow on the tide of relief, as one ending is postponed. 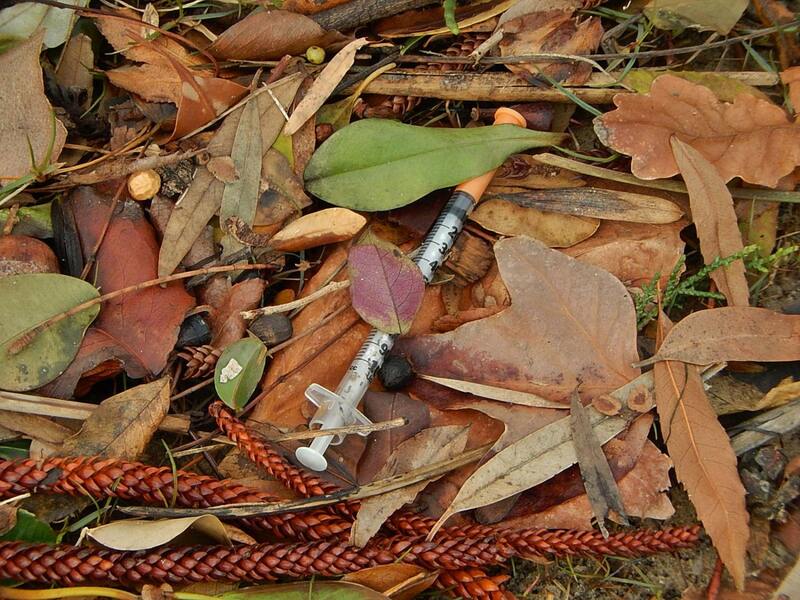 Fifteen years on, the same syringe, kept as a memento is now a tool for amateur destruction. Its husk lies forlorn, the hope it once carried now emptied into a vein. Again she holds his lifeless hand and seeks solace in my platitudes; but, today, I’m without any comforting phrase. Crushing my big brother’s ego felt good. He didn’t know, but I hated him. Always had. And after this job, I planned to kill him. Taking my hand off the ladder, I fingered the cyanide filled syringe tucked inside my jacket pocket. I imagined plunging the needle into his neck. I imagined death fogging his eyes like steam on a bathroom mirror. It excited me. I’d go from little brother to living brother just like that. One word replaced in a two word phrase. My breath condensed into clouds in the railyard where I’d found him . I cradled Benjy in my lap as he stared into the distance, eyes like glass beads. The syringe fell from his arm. My IV drip’s faster than you. Your IV drip hasn’t had its knees replaced three times. My IV drip doesn’t run its mouth, either. But can it call the night nurse when you fall out of bed? Can it swap chocolate for tapioca when no one’s looking? Does it …whisper your name when you’ve forgotten? Listen to me, lady. I’m going to catch you today. And again tomorrow. And every day, forever. If that’s a proposal, old man, I expect the proper phrase. “Catch my drift?” Doug asked, winking slightly. I stared at the needle on my lap through the dim lights of the dingy room. “It’s amazing.” He said almost to the syringe, as if he were trying to coax it into my arm. The needle kissed my veins. “Extra, Extra! College students’ death by overdose sparks a crackdown on drugs at schools nationwide!” Called the paperboy the next morning. All because of a cliché phrase. “Catch the serpent by his tail,” the words hadn’t meant anything to him when he’d started, but as he looked at the beaded string around his arm, he began to realize he was prisoner to the serpent’s bite. He watched it as it coiled and twisted, trying to choke the life out of him. Even as the primal part of him was telling him to fight, another part of him was struck by the creature’s beauty. He smiled as it showed its true colors, and he watched in mind numbing euphoria. He understood too late that ‘chasing the dragon’s tail was more than just a phrase.